Ancon will be launching its latest fixing innovations at Ecobuild, 6th – 8th March, London ExCeL, stand number C62. Double winner of the Queen’s Award for Enterprise and holder of a string of innovation and product development accolades, Ancon will continue to enhance its range in 2018. Ancon’s Ecobuild stand will focus on structural fixings that are opening-up new possibilities in zero and ultra-low energy construction by minimising thermal bridging, including its insulated balcony connectors and ultra-low thermal conductivity cavity wall ties. It will also showcase a brick-faced support system that allows designers to achieve exciting masonry façade aesthetics, quickly and easily on site. Heading up the displays will be Ancon’s unique, BBA-approved, multi-award winning Teplo wall tie range. Manufactured from pultruded basalt fibres set in a resin matrix (0.7W/mK), a material over sixty times more thermally efficient than steel (50W/mK), Teplo ties are widely specified in Passivhaus or similar low-energy developments. The stand will feature new Teplo variants. 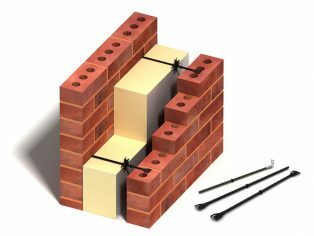 Firstly, Teplo wall ties for use with Ancon 21/18, 25/14 and 28/15 Channels and secondly, the Teplo-BFR, featuring a plain end for resin-fixing into an existing structure and a moulded safety end for building into a new masonry leaf – ideal for retrofit. Both product ranges will break new ground in the masonry fixings sector. Also under the spotlight will be Ancon’s comprehensive range of insulated connectors designed to limit heat loss at balcony locations. Now engineered to carry even greater loads, the latest Ancon steel-to-concrete connectors accommodate large cantilever balconies and situations where connections are limited due to rebar congestion or column layout. Completing a trio of innovative solutions is the Nexus system, which will be displayed as part of Ancon’s extensive brickwork support and restraint product portfolio. This modular brick soffit system, installed in a fraction of the time of a cast concrete alternative, was developed in association with prefabricated brickwork specialist, Ibstock Kevington. It combines a light, fully adjustable, brick-faced unit with Ancon’s trusted bracketed brick support angle. Available in any brick type, it is perfect for creating modern architectural brick details, such as deep soffits, reveals and flying beams, quickly and easily, and blends seamlessly with the wider façade. Designed to attract forward-thinking professionals from the UK and beyond, Ecobuild 2018 will feature ‘futurebuild’ districts, bringing together the latest in materials and technologies, and a conference programme designed to share knowledge and best practice in both design and construction.